Welcome to Sepkoski's Online Genus Database! This database is a direct port of Sepkoski (2002). It was constructed by Shanan Peters and is currently maintained and hosted by him at the University of Wisconsin-Madison. For more information about the database, including important details about how Sepkoski's original entries were handled, please click here. The purpose of this database is to allow users to easily search and summarize Sepkoski's global genus compendium on the basis of Evolutionary Fauna, Phylum, or Class. 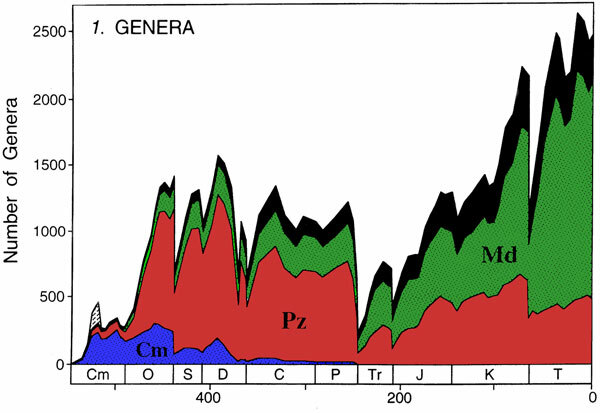 You can recover customized lists of genera and their stratigraphic ranges (according to Sepkoski) as well as summaries of genus richness and taxonomic rates of evolution. As time permits, I will be adding additional features to this database, including the ability to search for a genus name and to obtain lists of taxa by stratigraphic interval. If you have a specific feature request, please feel free to contact me and I'll see what I can do. You are welcome to use these data with proper citation of Sepkoski's work. It would also be appropriate to acknowledge this online database.